United Yacht Sales New Jersey would love to guide you through a personal showing of this 74' Hatteras Motor Yacht Sport Deck 1999. 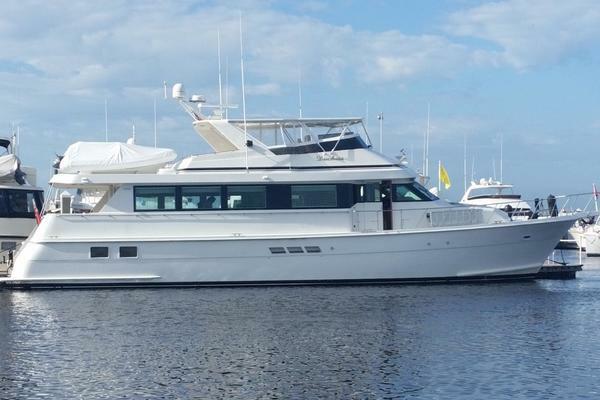 This yacht for sale is located in Ft. Lauderdale, Florida and priced at $923,000. For a showing please contact us by filling out the form on this page and we will get back to you shortly! Sleeps 8 in four staterooms that have all been refit in 2017, including master, VIP and guest staterooms with four heads. VIP 1 and 2 plus bunk room with ensuite head and shower. There is a large glass door entry from the aft deck into the salon. Interior features include maple interior and custom woodwork ceiling covers around the salon perimeter. The salon has Roman shades with operable Hunter Douglas blinds beneath, new carpeting, a sectional sofa with chaise lounge at aft end with storage underneath, decorative throw pillows, custom Release Marine cocktail storage with liquor storage below. A cocktail table in high gloss maple. A full entertainment center is located in the starboard salon with new 55'" TV that raises from the cabinets. Storage along starboard side of Salon as well. 2017 Release Marine coffee table with wine/liquor storage. A 50" round dining table is located forward with six chairs. The master stateroom is accessed through a stairwell down from the salon and features Roman shades, a vanity finished in natural maple, hanging lockers, and plenty of drawer storage. His and her heads are accessed on each side of the king berth with a Jacuzzi between the heads; The master head features Italian beige countertops with matching tile flooring laid at a diagonal. Mirrors surround the medicine cabinets, back splashes and overheads. Queen-size berth with new (2017) decorative coverlet, pillow shams and matching valance. Lighting and hanging locker with private head access. Queen-size berth with new (2017) coverlets, pillow shams and throws, artwork, lighting, hanging locker and head access. Upper and lower berths, private ensuite head and shower. Large molded fiberglass Fly Bridge with ample U-shaped deck seating, helm chair plus one companion chairs, aluminum radar arch with light mast, "Keyhole bar" layout with hard top with Esinglass enclosure. Built in fridge under bar with ice maker. Owner's personal belongings. List upon request.